Research says "Versa is known for its superior platform-level solution that supports the needs of large communication service providers (CSPs) around the world"
Quadrant Knowledge Solution's report analyzed SD-WAN market dynamics, opportunities and the vendor ecosystem. As part of its research, Quadrant's competitive analysis of the SD-WAN market compares SD-WAN vendors' products and solutions capabilities in supporting different use cases. Quadrant analyzed vendors in terms of product portfolio, product innovation, sophistication of technology, competitive strategy and customer impact. 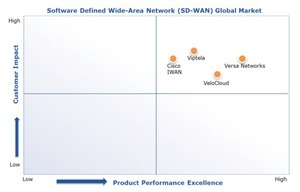 From its research findings, Quadrant Knowledge Solutions recognizes Versa Networks' product performance leadership in the global SD-WAN market. Report author and Quadrant Knowledge Solutions senior analyst Jaideep Singh wrote, "The Versa solution is based on virtualized network functions (VNFs) and is designed for large enterprises and services providers to improve WAN and branch network performance and agility, while reducing the costs associated with proprietary network hardware." The Versa SD-WAN solution consists of Versa FlexVNF, Versa Director, and Versa Analytics software components. Together they enable a flexible and scalable SD-WAN and Software-Defined Security (SD-Security) at the branch office. "Versa is very well positioned to provide advanced SD-WAN and SD-Security solutions to communication service providers. However, the company is also expanding its presence in providing solutions to large enterprises," Singh added. Enterprises with multiple branch offices often face challenges in managing and securing their WAN and branch networks due to ever-growing bandwidth requirements, network complexity, increasing use of cloud resources and growing security challenges. In building managed services, providers face several challenges with traditional WAN products including slow service definition and deployment times, high cost of networking infrastructure and high operational costs. Singh concluded by saying, "Versa Networks with its advanced SD-WAN and SD-Security solution is well positioned to help enterprises and service providers in achieving significant business advantage by improving agility, network performance and capacity, security and reducing costs. Driven by strong overall performance in terms of product portfolio, product innovation and customer impact, Quadrant Knowledge Solutions recognizes Versa Networks' product performance leadership in the global SD-WAN market." "Being recognized as the product performance leader over other vendors is a great way to start the new year," said Mark Weiner, CMO at Versa Networks. "Our deep bench of talented network and security engineers has developed a market-leading platform that meets a broad range of customer needs from SD-WAN to security and beyond. This year we are poised to further scale Versa deployments globally." Founded by network industry veterans, Versa Networks is an innovative vendor in the SD-WAN and SD-Security market. Versa's solutions enable service providers and large enterprises to transform the WAN and branch networks to achieve unprecedented business advantages. Versa's carrier-grade NFV software provides unmatched agility, cost savings, and flexibility, compared to traditional network hardware. The company is backed by premier venture investors Sequoia, Mayfield, and Verizon Ventures. For more information, visit http://www.versa-networks.com.